Kristopher Brooks was selected as the Faculty Focus Friday employee for middle schools. Mr. Brooks is the PBIS Specialist for Diamond Valley Middle School. He has quickly built positive relationships with students, staff, and families. During the first month of school, Mr. Brooks provided support to families in need by providing resources to support student success at Diamond Valley Middle School. Additionally, Mr. Brooks works diligently with at-risk students to support their social and emotional needs. He is a caring person who listens to understand, provides positive motivation and needed support to all students. 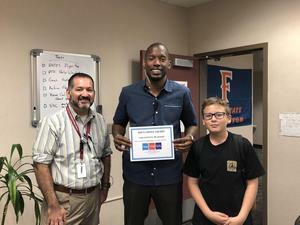 For the month of September, Mr. Brooks was recognized by Sylvan Learning Centers as a result of one of our students, Ethan Ulloa, nominating him as "Kid's Choice" educator. Way to go Mr. Brooks, and keep making Diamond Valley SHINE!